I have been trying to get some things done around the house so today decided to tackle the shower. I mixed 1 teaspoon Dawn dish soap, 1 drop Jet Dry and water in a Dishwand then cleaned the shower walls and glass doors! I also cleaned up the shower organizer (it was really bad) so the shower looks so much better. Then I cleaned out the magazine rack beside my bed--lots to throw away! I feel so much better when I am getting things cleaned and organized! The card for today is the one I made for my granddaughter for her 9th birthday last month! I combined two of my favorite stamp sets for this card...Sweetie Pie (sold out but I put a request in for Stampin' Up! to bring it back) and Flower Shop! 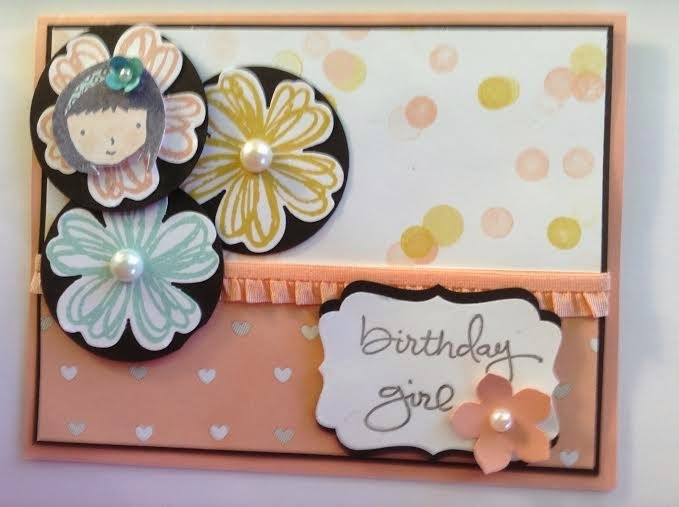 This card was inspired by one I saw on Pinterest by Kathleen Wingerson at Kathleen Stamps. I hope you are having a great day! Thanks for stopping by!